Enjoy this getaway mountain home in the desirable Aspen Groves community! This home in Aspen Groves with 3 bedrooms and 2.5 bathrooms, expansive great room with living area, dining, kitchen, and patio with amazing mountain views. Enjoy the many hikes/bikes that can start and finish from the house and you are just two miles away is Big Sky Town Center which offers numerous shops, restaurants, free concerts in the park, movie theaters, farmers market and much more. From your home, a short drive to the ski lifts, shopping, restaurants, hiking trails, mountain bike trails, lake, spa, and Big Sky Golf course. 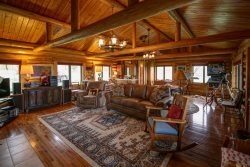 - Outstanding location – 10-minute drive to Big Sky Resort, 2.5 miles to Big Sky Town Center, 53 miles to West Yellowstone Entrance. - Gas Range,Coffee Maker, Coffee Grinder, Mixer, Toaster, Blender, Roasting Pan, Bakeware, Basic Spices, Trash Bags, Dish Soap, Dishwasher Soap, Sponge, and Paper Towels. Our family thoroughly enjoyed our vacation! Great location (only a few minutes from Big sky Resort). The house was very comfortable and the hot tub was a big hit after skiing all day. Would definitely book again!